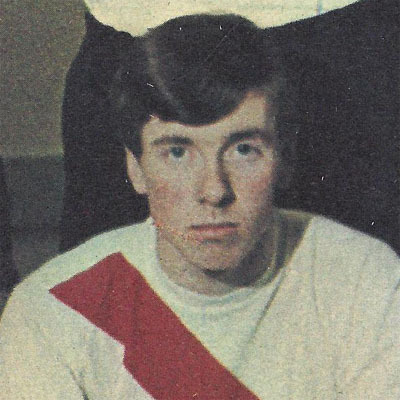 Jimmy Caskie was a skilful winger who joined the Bankies from Dumbreck Amateurs. Despite constantly being referenced alongside his father who was a successful player, JImmy would make his own mark with Clydebank. Signed as a 17 year old Jimmy was one of the Bankie Babes and was touted for big things with numerous clubs scouting him. The big move failed to materialise despite Jimmy turning in many match winning performances. He would eventually be placed on the transfer list at his own request. Partick Thistle finally took a chance on Jimmy, but he failed to break into the first team and he subsequently moved to Stirling Albion. After a short period at Annfield Jimmy returned to Kilbowie in January 1975. The Bankies had a certain Davie Cooper by this time and Jimmy found himself as a bit part player. He was part of the Second Division championship winning side, and was in the squad during the promotion winning season to the Premier League but never featured despite being on the bench on several occasions. The big time was to elude Jimmy as he joined Stenhousemuir at the end of that season where he finished his career. Jimmy was subsequently inducted into the Clydebank FC hall of fame with over 200 appearances and 66 goals for the club. Jimmy was born on this date in . Clydebank faced what looked to be an easy match when they lined up against Cowdenbeath, they team they had already beaten twice in the League Cup. Bankies biggest problem was to try and put the memory of the Firhill disaster out of their minds and return to their winning ways. Their cause was not helped by Jim Fallon missing out with his leg injury and to compensate for this Dougie Hay moved into the back four with Jimmy Caskie returning to the left wing. Bankies made four changes from last week for the visit of Queen of the South, in an effort to find a winning formula. Out went Sammy Henderson with a knee injury to be replaced by fit again Dougie Hay. Out went Jimmy Caskie as Jim Lumsden returned as suspension, and two inevitable changes were also made. Sam Goodwin and Mike Larnach, who have both looked tired and jaded in recent weeks, were rested and Billy Fanning and Ian Browning deservedly took their places.